Flying robots have long been a staple of science fiction narratives, whirring and buzzing overhead in the decades before technology caught up to make them a reality. These days, fiction has become fact: we live in a world where you can build a quadrotor, UAVs patrol the skies, and everyone and their mother has a GPS with better directional sense than Darth Vader’s Viper Probe Droids. Here are some of the sci-fi visions that continue to inspire UAVs and GPS as we know them. Humans have been fascinated with the idea of having airborne intelligence at their command since time immemorial. The Greek god Zeus is said to have sent a great eagle to do his bidding on Earth (sometimes he would shapeshift into the form and take wing himself), and Norse god Odin had a pair of magic ravens, Huginn and Muninn, that conducted daily remote surveillance. In 1849, Austria launched one of history’s first real aerial campaigns — bombing Venice using 200 balloons carrying explosive. Throughout successive world wars and conflicts, technology has developed to soar through the air for purposes of observation, communication, and defense. 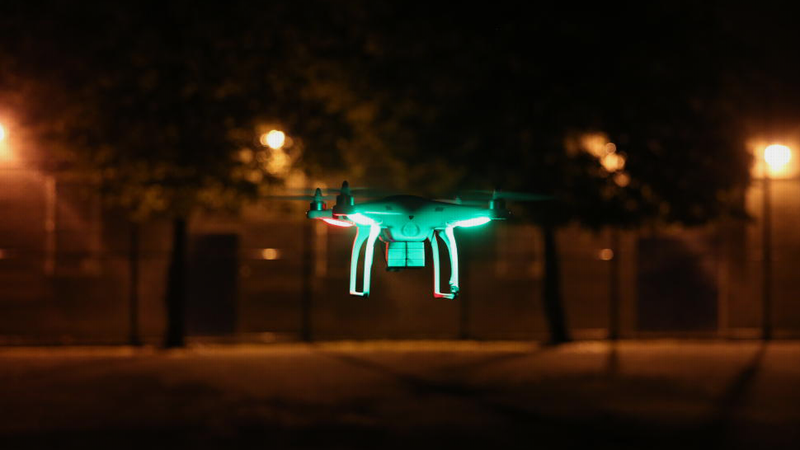 In science fiction, where stories look towards the future of technological evolution, UAVs are a constant character. They’re found alongside futuristic bounty-hunters and farmboys, warriors and scientists. They are man-made space stations that know too much, like 2001’s HAL, or the brilliant plotting ships late author Iain M. Banks imagined. We’ve come to expect the tech of the future to be clever and crafty. With the concept of A.I. and sentient pilots contributing to successful expeditions, we can run the gamut from The Day The Earth Stood Still to Cylon Raiders out of Battlestar Galactica to the Leviathans of Farscape to R2-D2. My favorite recent fictional creation that suggests the possibilities of our UAV-filled future is EVE (“Extraterrestrial Vegetation Evaluator”), the hero trash-compacting robot WALL-E’s love interest. A sleek, smart flying probe who looks like something out of Cupertino, EVE has one line throughout the Pixar film (other than repeating the eponymous main character’s name): “Directive.” EVE has been sent to search for signs of plant life on an Earth ruined by human neglect. She finds the evidence she’s looking for in WALL-E’s collection of Earth ephemera. Then, directive completed, EVE goes into standby and is recovered by her ship – thus launching the lovelorn WALL-E into space to find her. We’re not quite at EVE levels yet, but NASA’s Mars rovers, with their mission of exploration and environmental analysis, are getting us there. Global positioning systems are also tech fantasies that have emerged into present-day use. People have long been seeking ways to determine our time and place on Earth; The information we now take for granted was once determined via elaborate star-charts. Now we use a multitude of satellites to tell us where we are — an idea that author and futurist Arthur C. Clarke, often credited with predicting the rise of such technologies, would surely have applauded. One of “The Big Three” modern science fiction writers, alongside Isaac Asimov and Robert Heinlein, Clarke is considered a force of nature in speculative fiction, esteemed for novels like Childhood’s End and co-writing the screenplay of 2001: A Space Odyssey, based on his short story. Where would this technological leap leave humanity? “No-one on the planet need ever get lost or become out of touch with the community, unless he wanted to be,” Clarke mused, describing the state of the hyper-connected planet we currently inhabit. “I'm still thinking about the social consequences of this!” Clarke was content to watch real-world tech arise and return to the business of telling fantastical tales about triumphs and dangers of such advancements: “[A]s for details of frequencies and powers, I'll have to leave that to the experts to work out; I'll get on with my science fiction and wait to say ‘I told you so!’"
We now live a world quite like the one Clarke glimpsed decades ago. If you’re Luke Skywalker, you might be able to turn off your guidance system and fire on the Death Star using nothing but the Force — but the rest of us couldn’t imagine a roadtrip without a talking GPS guide to get us there. When we look forward, we see a world shared with adept robots, hovering machines and networked tools to better view our planet and ourselves. And looking forward is the raison d'etre of initiatives like The Air Force Collaboratory. It's a unique platform for people interested in what this technology can do both today and tomorrow — like teaching quadrotors how to think and conduct search missions. This is an incredible opportunity to get involved in building the next generation tech. Interested? Click here to start working with the minds behind The Air Force Collaboratory. Kaila Hale-Stern is a writer who lives in your social media stream and works on saving science fiction's past for the future.